Seeing the videos from that night brings back happy memories. Blessed. This goes back to nearly the beginning of Audio Adrenaline's recording career. The video is hokie. But the song is still great. This was a great band. Looks like they shot some of this on the same beach used by the Newsboys for their He Reigns video. A song about the forgiveness of God, reminiscent of Psalm 103:12: "As far as the east is from the west, so far has He removed our transgressions from us." All who repent and believe know this forgiveness and the new and everlasting life that God came to bring to us in the crucified and risen Jesus. For some people, it's still Good Friday, though it's after midnight on Saturday morning in my part of the world. Along with Christmas Eve, I think that Good Friday is my favorite special day on the Church calendar. To think of what Jesus, God in the flesh, did for sinners like me is overwhelming. By the death of this sinless Savior in our place, He banishes sin and death from the eternal futures of all who believe in Him. Then, by the Holy Spirit, God guides us, despite our imperfections and the sadness that often comes our ways, through this life. Good Friday shows us graphically and definitively, God's amazing grace. Martin Luther taught that if you want to know what God is like, look to Christ on the cross. There, God's love for all is seen with clarity. Please pray that God will comfort those who mourn Christians killed in the Kenya massacre with the sure and certain hope of life everlasting for all who believe in Christ; give a humble, bold witness for Christ by all believers; and grant protection for all believers from the temptation to hate in the face of persecution. In Jesus' name. The Civil Rights Act of 1964 rightly prohibited discrimination on the parts of companies that provide services (such as restaurants and hotels) based on things like race, creed, or ethnicity. All of these prohibitions, in other words, ban discrimination or refusal to serve clientele on the basis of classifications. And that is as it should be. Every American, including those who identify themselves as LGBT, should be protected against discrimination. But the RFRA law in Indiana appears to have been about an entirely different subject altogether. It was meant to ensure that businesspeople who have moral objections to gay marriage did not have to violate their consciences by being part of such a procedure. People may disagree with such moral scruples. But just as I would hope that we would recognize the conscientious objection to war of someone seeking exemption from military service or the legitimate refusal of a businessperson not wanting to do business with the Ku Klux Klan, I also hope that we would recognize the right of conscientious objection to gay marriage. In America, no one should be forced by law to violate their conscience either in their personal or business lives. Discrimination based on gender identification is immoral. Commanding people to violate their consciences is immoral too. And deeply Un-American. While admittedly I'm unaware of all the stipulations of RFRA, I cannot see how protecting people's right to exercise conscience threatens anyone's civil rights. "Why do we call this 'Good' Friday?" That's what an inquisitive second-grader (named Isaac) asked me once. It's a sensible question. The day we commemorate as Good Friday, after all, brought multiple tragedies. Good Friday, which this year falls on April 3, is when Christians all over the world remember the day when Jesus of Nazareth, the One we believe was the Messiah (that is, the Christ, God's Anointed King of kings) was crucified. The Bible says that Jesus' death on a cross resulted from the rejection of the entire world, at least the entire world as known by Jesus' first-century followers: the people of God (the Judeans) and everybody else (the Gentiles), represented by the preeminent power of the day, the Roman Empire. The day we call Good Friday then, wasn't only tragic because the sinless God and Savior of the world died a horrible death. It was also tragic because a human race in need of salvation rejected God's outstretched hand, spurned the love of God, turned away from God Himself. But there is an even deeper layer of tragedy to the day. God the Father, the first Person of the Trinity, perfect and sinless, was separated from Jesus in those horrible hours when Jesus hung on the cross. God, in His holiness, cannot abide the mere sight of sin and on the cross, Jesus bore the total weight of all human alienation from God, all human distrust of God, and every misdeed, small and large, that's ever been committed or ever will be committed by the whole human race. God the Father simply couldn't look at Jesus on the cross because, utterly sinless though Jesus was, He voluntarily embodied our sin and took our punishment for it there. So, if Good Friday remembers that Jesus was rejected by the whole world and abandoned by God the Father, what could possibly be good about it? In short, they thought that Good Friday was all about what they did to Jesus. The subject of their sentences about Jesus' crucifixion would have been themselves. 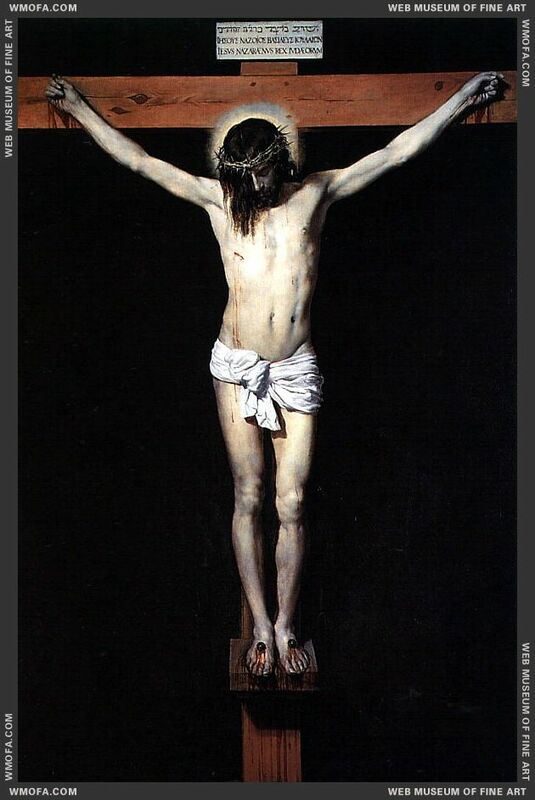 "We crucified Jesus," they would claim. Herod, the puppet king of Judea, known to have been a particularly violent, sadistic, and loathsome character, might have said, "I ordered Jesus' abuse. He was under my control." Pilate, the Roman governor, would have told anyone who would listen, "I exercised my power and had Jesus crucified." But, in fact, the events of Good Friday unfolded precisely as God wanted them to happen. Jesus came into the world to die for us. That was always the plan. This is something that the wise men from the East seemed to know even when Jesus was a baby. Among the gifts they brought was myrrh, an aromatic resin used to anoint the dead, hardly a fitting present for a baby when you think about it, a bit like giving a gift certificate from a casket factory at a baby shower. We call this day Good Friday because on the first one some two-thousand years ago, Jesus fulfilled God's plan. He took our punishment for sin and later, rose from death so that all who repent of sin and entrust their lives to Him will live forever. Good Friday is good because, just as it was the route through which Jesus moved to Easter, it's also the route through which all who believe in Him share in His Easter victory! It's because of what Jesus did on Good Friday for us, followed by God the Father raising Him from the dead, that you and I can confess our belief in the "forgiveness of sins, the resurrection of the body, and the life everlasting." Amen! Actually, I can never make it on my own. "You don't have to go it alone." I love Bono's background on this tune. "Like the top of a newborn baby's head. "I've seen enough I'm not giving up"
After all, once you've seen the songs in someone's eyes, why would one give up? I could listen to The Edge play all night long...hopefully, one day, I will. Herb Alpert, an accomplished trumpeter and recording industry magnate, was no singer. And that's part of the charm of this overproduced ballad. For all its hokiness, Alpert's "everyman" vocal made this recording a home run back when I was a kid. Out of the blue, I thought of this tune while driving from tonight's Maundy Thursday service. I hadn't heard it or even anything about the song for years. Even now, listening to it again for the first time in all that time, both the vocals and the lyrics are so straightforward and winsomely vulnerable, a perfect expression for the man in love with the perfect girl for him. The only lines I don't care for come at the beginning of the second verse: "I've heard some talk / They say you think I'm fine." Nonetheless, this ballad works as a touching love song. I remember playing it over and over back in the day. Having implied that Alpert was less than a polished professional singer, I have to say that, on this song, he sounds like Jim Morrison in a slightly higher key. Come to think of it, Morrison wasn't much of a singer either. On this Maundy Thursday, I want to talk with you about four gifts that God gave us on this special day: an example, a Savior, a command, and a power. But first, a story to explain why we need these gifts. On a Tuesday in Holy Week a few years ago, I was in a hurry to get back to my office and get some work done. Yet I was stuck in checkout line 4 at the local Kroger. I wondered if there really was a conspiracy designed to keep me from doing what I needed to get done. Just then a clerk popped his head out from between two unused check out lines. “You can check out on three now,” he announced. A woman who’d just happened by when the clerk appeared, quickly slid into line 3 and I pushed my cart in behind her. I was internally celebrating my good fortune when I looked back and saw the woman who had been standing in front of me in the congested line 3. It wasn’t until I left the store that I wondered--or maybe it was only then that I allowed myself to wonder--had I stormed ahead of her? I felt a pang of guilt. After all, she’d gotten into the longer line before I had. Hers was the right of first refusal on entry into the newer, quicker checkout line. But I realized that would have been a lie. Whether I actually had pushed ahead of her or not, honestly, I had intended to push ahead of whoever was in my way. I had been in a hurry and I thought the world needed to give way. You and I are born with the condition of sin, a condition of alienation from God. As the Bible and the Lutheran confessions teach, this condition of original sin is really sin. From our parents, we inherit the condition of fallenness and alienation from God as surely as we inherit their other genetic characteristics. On top of that, our condition predisposes us in big ways and small to push ourselves ahead of others, at the expense of others. To worship ourselves. To put our desires ahead of God’s will for human beings. To leave God and neighbor in the dust. It’s sin that makes our world such a mess. It's sin that messes up our individual lives. It’s sin that causes us to behave badly at grocery stores and other places. And the proper punishment for our sin is death, everlasting alienation from God. So what’s to be done about it all? God has done something about it and that’s why we’re here tonight, of course. And that leads us to those four gifts. It wasn’t done by a king. Or an important person. But God-in-the-flesh, Jesus, doesn’t care about usual human conventions. He breaks our rules--the rules that human beings often use to make themselves more important than others--in order to break us free from the grip that sin and death have over us. He breaks our rules in order to break open the kingdom of heaven to us. Jesus deals with sin first of all, by giving us example of sinless living. In Him, we see what a life free from the sinful impulse to push ahead of others is like. That’s the first gift from Jesus on Maundy Thursday. But, thank God, following Jesus Christ is about more than having an example. The condition of sin prevents us from living and acting like Jesus. No matter how much I may want to be like Jesus, I can’t use my willpower to follow His example. I can’t resolve to be righteous; my very nature conspires against any such resolutions. On the cross, Jesus entered into our alienation from God and accepted our punishment for sin, so that rising from the dead, He could offer new and everlasting life to all who believe in Him. Jesus saves sinners like me. Jesus isn’t just an example. He is our Savior. Thank God! This day is called Maundy Thursday, the word maundy coming to us from the Latin word mandatum, meaning mandate or command. That’s because after washing the disciples’ feet, Jesus gave a new command to all who make up His Church. He commands all disciples to love their fellow believers precisely as Christ has loved us. This third gift of Maundy Thursday may not seem like a gift to us, at first. After all, if Jesus only knew how annoying Christians can be. He know that, in fact. He even knows how annoying you and I are. But He he gives this command to us anyway. Jesus was willing to die for the good of the Church; He commands us to also be willing to die for the Church. You can't be a Christian without being part of the Church, this family instituted by Christ. The Church is the living embodiment of Jesus in our world. The Church is the place where recovering sinners are made to feel safe and where in our fellowship with one another, we experience Jesus using us to love others. This is why Jesus so values the Church, the only thing that will survive the death of this world and carry over into Christ’s new creation. And this is why Jesus commands us to love the Church and the disciples who are part of it with our whole lives, even to the point of death. If you’re like me, you’ll find that overwhelming. But it’s also comforting: It shows us just how valuable each and every individual believer in Jesus Christ is in the eyes of God. Fortunately for us, our Savior Jesus doesn’t just give us an example, save us, or give us a command without also giving us the means to fulfill His call on our lives. He gives a fourth gift, power. Jesus gives us the power to live as saved people, the power to follow His example even when we’ve failed, the power to recommit ourselves to doing as He commands despite our sinful natures. In a mysterious way we can’t understand or explain, Jesus literally enters into the bodies and the lives of those who renounce sin and entrust their lives to Him. We each come together in humble need of Christ and His forgiveness and He gives to each of us His very self. Christ uses this sacrament to help us, from the inside out, to follow His example and to fulfill His commandments. In the body and blood of Holy Communion, He sets to work to transform the lives of those willing to follow Him. Through the Sacrament and the Word, Christ makes us more like Himself. Jesus gives us power to become Christlike. We are and, while we live on this earth, will remain in the process of becoming what we eat, the heir of our Father in heaven. Among the many gifts God gives to us through Jesus Christ, four are good to remember tonight: His example, His salvation, His command to live with sacrificial love for His Church, and the power to become more like our Savior by regularly receiving His body and blood in the Sacrament we’re about to receive again. For Maundy Thursday and Good Friday. Jesus, God in human flesh, intentionally faced certain suffering and death because He thought of us above all...and through His crucifixion and resurrection for us, He has become above all! I find that I, personally, even though I've come to love this letter, I really have to bear down and think when I read James. It's as though he speaks a language foreign to me or, more accurately maybe, that he speaks a language I know but in an accent and with idioms I don't readily understand. For Lutherans, it has often seemed that while the rest of Scripture teaches that human beings are made right with God (justified) as an act of God's grace (charity) through faith (trust) in the God definitively disclosed in Jesus, while James is saying that you need good works to be saved. It can seem when one reads James that he is salvation as a gift on the shelf in favor of salvation by works, the latter of which is heresy. But that's not what James is saying at all. One early clue to that fact is what James writes about the Christian praying for wisdom: "But ask in faith..." (James 1:6). Faith is as much a cornerstone for James as for Paul. Today, the assigned reading for the 5 by 5 by 5 New Testament reading plan is James 2. "But someone will say, 'You have faith and I have works." Show me your faith apart from your works, and I by my works will show you my faith." It's simple, I realize, what James is saying. If we have faith in Jesus--if, in another words, we are surrendered to Him as God and King over our lives, it will have an impact on the things we do. If, on the other hand, we compartmentalize Jesus with a Christian compartment here, a professional compartment here, a relationship compartment there, and so on, our fragmented life will demonstrate that we have little or no faith in Christ, that we lack a saving relationship with Christ. When Christ is Lord over us, often without our even seeing it, His presence active within us and our trust in Him, will issue in works of love and compassion. Jesus once warned His followers against "false prophets," preachers and teachers who spoke falsely on God's behalf. (The antidote for this, of course, is for us to get to know God and His Word in Scripture for ourselves so that no wolf is ever able to pull the wool over the eyes of we sheep.) But in doing so, Jesus enunciated a principle that can clarify things as we look at our own lives: "You will know them by their fruits" (Matthew 7:16). If we believe in Jesus Christ, it will show in acts of love and selflessness. If we truly trust in Christ, it will be demonstrated--however imperfectly, however it may sometimes get obscured by our selfishness and shortsightedness, in the things we do. If we believe in Jesus Christ, it will show in acts of love and selflessness. We can't be made right with God--saved from sin and death, by the good things we do. Christ on His cross has already done everything needed for us to be saved. We need only trust in Him. But trust in Him will erase our fears over our worthiness or our capacity to help others without denigrating ourselves. We won't mind being servants of all, just as Jesus was a servant of all, even our servant when He went to the cross. We're set free "to be the people of God," free to love God completely and love others as we love ourselves. That's why James closes chapter 2, with a simple and powerful observation: "For just as the body without the spirit is dead, so faith without works is dead" (James 2:26). "Faith" that doesn't result in works of love demonstrates that there is no faith, that the confessions of compartmentalized Christians (counterfeit Christians) are so much hot air. Good works without faith are done by human effort, with no reference to God, without the hand of God, devoid of the power of God. Good works empowered by, inspired by, directed by God demonstrates authenticity of faith in the doer and has God's power for transformational good in them. Snippet from an interview with U2's lead singer and prime lyricist Bono. He talks about who he believes Jesus to be. When I was an atheist, delving into the proclamation of the Bible about Jesus, I came to a crossroads at which I had to decide, in Bono's phrasing, if Jesus was "a nutter" or precisely Who He claimed to be: true God and true man, Lord, and only Savior of the world. A man who was merely a man and said the sort of things Jesus said would not be a great moral teacher. He would either be a lunatic--on a level with a man who says he is a poached egg--or else he would be the Devil of Hell. You must make your choice. Either this man was, and is, the Son of God: or else a madman or something worse. You can shut Him up for a fool, you can spit at Him and kill Him as a demon; or you can fall at His feet and call Him Lord and God. But let us not come with any patronising nonsense about His being a great human teacher. He has not left that open to us. He did not intend to. In many churches, no doubt partly in recognition of the fact that many Christians won’t be commemorating Holy Week at Maundy Thursday and Good Friday services, this is designated not as Palm Sunday but as The Sunday of the Passion, a Sunday that remembers Christ’s suffering and death for us. Personally, I prefer to give Palm Sunday its due as a separate day on the Christian calendar. Besides, as we’ll see, there is a whiff of murderous conspiracy against Jesus and a hint of the agonies of His crucifixion and death that can be detected amid the celebrations of Palm Sunday. Palm Sunday isn’t all "happy happy joy joy." To set the stage for what happens in today’s gospel lesson, which gives us John’s take on the first Palm Sunday, it’s important to remember what comes just before this event. In John 11, Jesus raises His friend Lazarus from the dead, the seventh and final sign John records Jesus performing. But even miracles of God can be ignored or even more improbably, arouse controversy. In John 11:45, we’re told that some who had witnessed Jesus bringing Lazarus back to life ran off to tell the Pharisees what had happened. It’s a classic case of the haves wanting to protect what they have. In John 11:47-48, we see that these religious leaders are more interested in maintaining their status and their religious traditions, than following God. They worry that Jesus will gain such a following that the Romans will be alarmed and destroy the very institutions that guaranteed them their cushy lifestyles and gave a modicum of peace--the enforced peace of an iron dictatorship, what was called the pax romana--in the midst of their people’s oppression. So, as Jesus prepares to enter Jerusalem on Palm Sunday, the religious leaders are hatching a plot to kill Jesus from selfish, fearful motives. They’re clueless about the the fact that, Jesus, “the Lamb of God Who takes away the sin of the world,” was going to the holy city with the intention, according to God’s plan, of sacrificing Himself on the cross in order to save the world from more than death in this world. He was going to die and rise to save all who entrust themselves to Him from sin and from the more lasting and horrible death of eternal separation from God. Jesus died at precisely the moment when God had decided He would die. The leaders didn’t know it, but they were doing the will of God against their wills. In our lives, we often think that we’re clever and in control. But, whether we perceive it or not, God is still in control. We may endure tragedies and heartbreaks, as well as loves and loved ones lost, but God is bound to bring His good out of bad. God will use Good Fridays to bring Easters for those who place their hope in Him alone! All of this looms in the background as Jesus and His disciples enter Jerusalem at the beginning of our gospel lesson. Please go to it, John 12:12-19. The words and the palm branches used to welcome Jesus, help us to see that while the people see Jesus as a king, they want Him to be an earthly king who uses military might to save them from the oppression of the Romans. Jesus is the King--the Messiah, Lord of heaven and earth. But He doesn’t conquer by force of arms or by using a democratic vote. (If Jesus' Lordship were dependent on majority votes, even in most churches, He would most likely lose.) Jesus' power isn't derived in any form of human power or manipulation. Instead He conquers by a servant love that dies for us. And the enemies He conquers are the common enemies that live in every human soul: sin, death, darkness. Jesus has encountered people wanting to make Him a king on their terms before, of course. Before Jesus began His public ministry, He was offered the crowns of every nation on earth by Satan, if only He would worship Satan. Jesus won’t be our king on our terms. Jesus becomes our Lord only when we give Him unconditional surrender, allowing Him to crucify our sinful selves so that our new selves, remade in Christ’s image, can rise. Jesus commands us to trust in Him just as He trusted in God the Father. Jesus claimed His eternal kingdom not through force, but through surrender to death and trusting that the Father would raise Him on the third day. Jesus isn’t shy about claiming His kingship. He says, "The Father and I are one." And just as prophesied by Zechariah 9:9, in the Old Testament, He comes to banish our fears and bring us God’s kingdom. Also as Zechariah said, He was riding on a donkey. Donkeys always had a better press than horses among God’s people in Biblical times. Horses strapped to chariots were the means by which malicious foreign powers had done harm to them. Donkeys were even seen as the more majestic animal, the mount of a dignified and reputable king. But, as John tells us, not even Jesus’ closest followers understood Jesus at this moment. We shouldn't be too hard on them though. Even today, I find Jesus' ways and will difficult to understand. There have been times in my years of following Jesus when it has seemed to me that Jesus has blocked from my life the very things that I knew would bring me happiness. Only in heaven will we more fully understand Jesus and His mysterious ways. There are some things we can't understand about Jesus while we live in this world. But anyone, Christian or not, who tries to understand Jesus apart from His death and resurrection or apart from His call to follow Him because He is the only way to life with God--if they try to see Jesus only as a great teacher or a kind man, or only as a religious leader, they are missing the point. On the first Palm Sunday, neither the crowd, nor Jesus’ own disciples, nor the Jewish religious leaders nor the Romans, had a clear understanding of Jesus. I'm convinced that some knew that, in meeting Jesus, they were facing God in the flesh. But ignorant or not, they all disregarded His signs and the substance of His teaching, refusing Jesus’ terms of total surrender as the way to life, and instead, saw Him on their terms, which is the way to death. Jesus raising Lazarus from the dead was seen as an interesting use of power. It proved Jesus had power that others didn't possess. The crowds hailed Jesus as king because of a sign, not because of what the sign pointed to. Jesus had power; now the people hoped to draft Jesus as king to do their bidding. Within days, these same Passover crowds would demand Jesus’ execution. People can turn on God on a dime. A woman I knew years ago became bitter with God because, after her mother, in her late eighties, had suffered a long train of illnesses in the final few years of her life, died. “I’m mad at God for taking my mom from me,” she said. I wanted to ask the woman if she would like it if her mother, a believer now free from suffering and in the presence of God, would be brought back to this earthly life by God just to make her happy. I bit my tongue. But it’s questions like these we need to ask ourselves when God disappoints us. We tend to think in the short term. God has an eternal perspective. Jesus is seen as a threat by the Pharisees. And, in truth, Jesus is a threat to us whenever the things valued by this world--security, wealth, health, family--become more important to us than welcoming King Jesus to rule over our lives. None of the things valued in this world can bring us what only Jesus can bring us: peace with God, the presence of God with us through all the times of this life, and life with God now and in eternity. The call of Palm Sunday is to surrender--totally, unconditionally--to Jesus, letting Him forgive us our sins, letting Him guard us from separation from God, and letting Him give us life everlasting. I look forward to being with you on Maundy Thursday and Good Friday and Easter Sunday, so that, once again, we can celebrate Jesus not as the king we want when sin has its way with us, but as the King we need when we let Him reign over us.